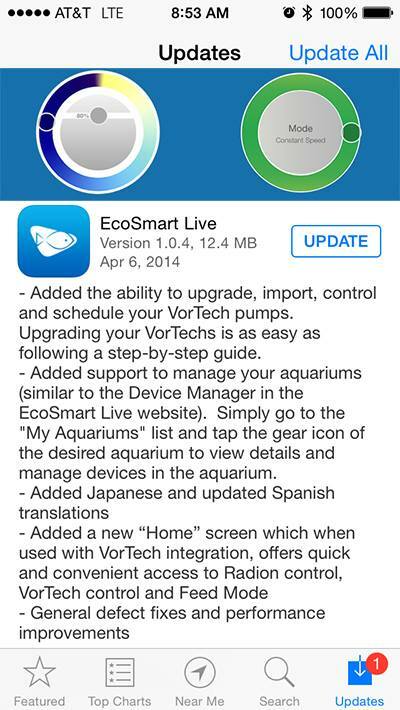 As part of the continued effort to integrate the VorTech pumps into EcoTech Marine’s EcoSmart Live system, an update to the EcoSmart Live app has been released that allows users to control their VorTech pumps via any iOS powered device. Just last month, EcoTech added VorTech control to their Reeflink, for the first time allowing the ReefLink and EcoSmart platforms to live up to their promises of simultaneous wireless control of the Radion XR30w LED fixtures and the popular pumps. The update app has the same look and feel of the previous verions that only offered Radion control, but adds the touch sensitive wheel right alongside the Radion controls. This touch sensitive wheel is dual purpose, allowing the speed of the pump to be adjusted, as well as the flow mode. This app is free to download from Apple’s App Store and an Android friendly version will shortly follow.